Posted on August 10, 2017 by Clara Halpern. Every day during the run of our summer exhibition Propped, the last visitor to Gairloch Gardens is presented with a gift on their way out: flowers. 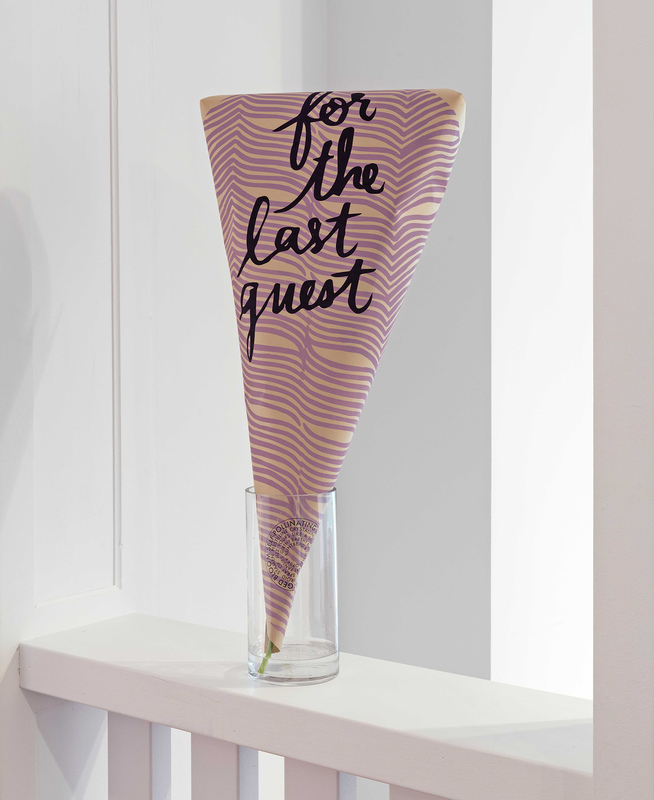 For the last guest (2014/2017), a work by Mark Clintberg and Benny Nemerofsky Ramsay, sees an arrangement of flowers placed in a vase at the entrance of the gallery, wrapped in paper designed by the artists. At the end of each day, the last visitor to the gallery is given the arrangement to take home with them. Of course, try as we might, we at the Galleries are imperfect hosts ourselves—we’ve gifted the flowers too early, as another visitor sneaks in the door, and gifted them too late, chasing visitors down in the garden as they leave. Sometimes, though, we manage to get it right: recently our animateur Audrey Yip gave the flowers to a young visitor, whose parents were touched, noting that it also happened to be the day of her graduation from school. Installation view of Mark Clintberg and Benny Nemerofsky Ramsay, For the last guest, 2014/2017, silkscreened print on glassine, flowers, vase. From Propped, Oakville Galleries, 25 June – 2 September 2017. Courtesy of Mark Clintberg (courtesy of Pierre-François Ouellette art contemporain, Toronto) and Benny Nemerofsky Ramsay. Photo: Toni Hafkenscheid.